Good things come in small packages is how to best describe our Sleep Philosophy Flexapedic contour knee pillow. 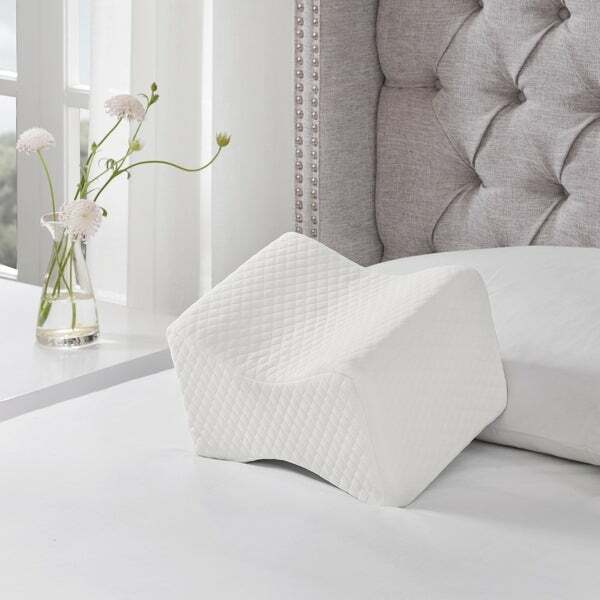 This pillow was created with side sleepers in mind (approximately 47-percent of the population); it creates the proper posture while side sleeping by elevating the upper knee and allows for a more comfortable night's sleep. This pillow helps ease back, leg, knee, ankle and hip joint pain by providing proper spinal alignment and reducing pressure while you sleep. Also perfect as a knee spacer during pregnancy or post-surgery recovery (hip replacements). Our pillow is constructed out of study urethane foam with a 1 inches gel infused memory foam outer layer on the sides which helps keep you cooler while molding the pillow to your exact shape. We've topped it off with a machine washable, breathable knit cover. Overall the product is of good quality and definitely helping with sleep posture and alleviating pressure pain to my lower back. I do wish the material the cover is made out of was softer (perhaps cotton). I need to use a small pillow case otherwise it feels itchy against skin.